The ESA, under section 4(c)(2), directs the Secretary of Commerce to review the listing classification of threatened and endangered species at least once every five years. After completing this review, the Secretary must determine if any species should be: (1) removed from the list; (2) have its status changed from threatened to endangered; or (3) have its status changed from endangered to threatened. The most recent listing determinations for most salmon and steelhead occurred in 2011. 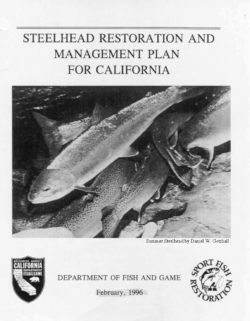 NMFS completed a 5-year status review in 2011 and concluded the status for threatened Central California Coast (CCC) steelhead should remain the same. 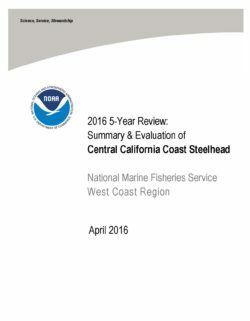 This document summarizes NMFS’s current 5-year review for the threatened CCC steelhead. Many West Coast salmon and steelhead (Oncorhynchus sp.) stocks have declined substantially from their historic numbers and now are at a fraction of their historical abundance. There are several factors that contribute to these declines, including: overfishing, loss of freshwater and estuarine habitat, hydropower development, poor ocean conditions, and hatchery practices. These factors collectively led to NOAA’s National Marine Fisheries Service (NMFS) listing of 28 salmon and steelhead stocks in California, Idaho, Oregon, and Washington under the Federal Endangered Species Act (ESA). The ESA, under Section 4©(2), directs the Secretary of Commerce to review the listing classification of threatened and endangered species at least once every five years. After completing this review, the Secretary must determine if any species should be: (1) removed from the list; (2) have its status changed from threatened to endangered; or (3) have its status changed from endangered to threatened. The most recent listing determinations for West Coast salmon and steelhead occurred in 2010, and prior to that 2005 and 2006. 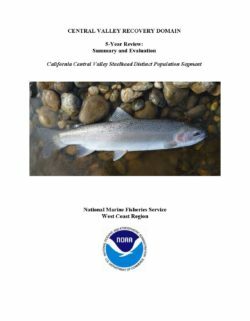 This document summarizes NMFS’s 5-year review of the ESA-listed California Central Valley (CCV) steelhead Distinct Population Segment (DPS). The South-Central California Coast Distinct Population Segment (DPS) is listed as threatened and is comprised of a suite of steelhead populations (Oncorhynchus mykiss) that inhabit coastal stream networks from the Pajaro River south to, but not including the Santa Maria River. Freshwater-resident (non-anadromous) O. mykiss, commonly known as rainbow trout, also occur in the same geographic region, frequently co-occurring in the same river systems as the anadromous form. Clemento et al. (2009) found that O. mykiss above and below impassable dams within the South-Central Coast DPS tended to be each other’s closest relatives, suggesting that each steelhead DPS is simply the anadromous component of a corresponding Evolutionarily Significant Unit (ESU; Waples 1991) comprising both anadromous and resident O. mykiss. Anadromous and/or freshwater forms of the species also occur in some basins south of the U.S.
border, on the Baja California Peninsula (Ruiz-Capos and Pister 1995). West Coast salmon and steelhead (Oncorhynchus spp.) stocks have declined substantially from their historic numbers and many now are threatened with extinction. Multiple factors have contributed to the declines of individual populations. These include the loss of freshwater and estuarine habitat, periodic poor ocean conditions, and a variety of land-use, flood control and water management practices which have impacted many watershed-wide processes; these include sedimentation and hydrologic processes which create and sustain essential steelhead habitats. These factors collectively led to the National Marine Fisheries Service (NMFS) to list south-central California coast steelhead (the anadromous form of O. mykiss) as threatened under the ESA in 1997 (Figure 1). Section 4(c)(2) of the ESA directs the Secretary of Commerce to review the listing classification of threatened and endangered species at least once every five years. After completing this review, the Secretary must determine if any species should be: (1) removed from the list; (2) have its status changed from threatened to endangered; or (3) have its status changed from endangered to threatened. The most recent listing determinations for salmon and steelhead occurred in 2005 and 2006. 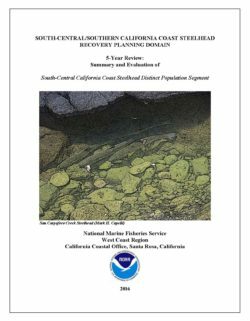 This document reflects the agency’s 5-year review of the ESA-listed South-Central California Coast Steelhead Distinct Population Segment (SCCCS DPS) since the last status review in 2010 (Williams et al. 2011). The Southern California Coast Steelhead Distinct Population Segment (DPS) is listed as endangered and is comprised of a suite of steelhead populations (Oncorhynchus mykiss) that inhabit coastal stream networks from the Santa Maria River system south to the U.S. border with Mexico. Freshwater-resident (non-anadromous) O. mykiss, commonly known as rainbow trout, also occur in the same geographic region, frequently co-occurring in the same river systems as the anadromous form. Clemento et al. (2009) found that O. mykiss above and below impassable dams within the Southern California DPS tended to be each other’s closest relatives, suggesting that each steelhead DPS is simply the anadromous component of a corresponding Evolutionarily Significant Unit (ESU; Waples 1991) comprising both anadromous and resident O. mykiss. West Coast salmon and steelhead (Oncorhynchus spp.) stocks have declined substantially from their historic numbers and many are now listed as threatened or endangered. Multiple factors have contributed to the decline of individual populations. These include the loss of freshwater and estuarine habitat, periodic poor ocean conditions, and a variety of land-use, flood control, and water management practices which have impacted many watershed-wide processes; these include hydrologic and sedimentation processes which create and maintain essential steelhead habitats. These factors collectively led the National Marine Fisheries Service (NMFS) to list southern California steelhead (the anadromous form of O. mykiss) as endangered under the ESA in 1997 (Figure 1). Section 4(c)(2) of the ESA directs the Secretary of Commerce to review the listing classification of threatened and endangered species at least once every five years. After completing this review, the Secretary must determine if any species should be: (1) removed from the list; (2) have its status changed from threatened to endangered; or (3) have its status changed from endangered to threatened. The most recent listing determinations for salmon and steelhead occurred in 2005 and 2006. 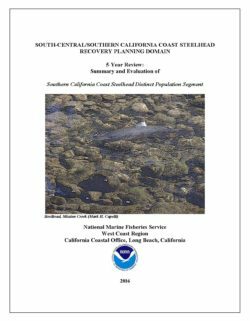 This document reflects the agency’s 5-year status review of the ESAlisted Southern California Coast Steelhead Distinct Population Segment (DPS) since the last status review in 2010 (Williams et al. 2011).